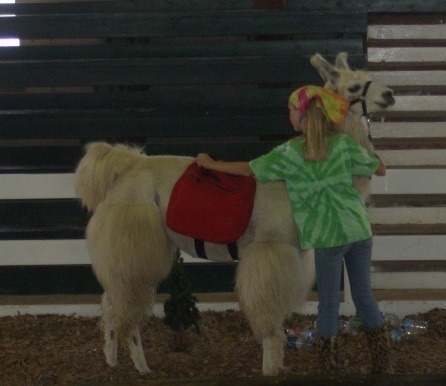 Llamas have become a huge part of our family. We love to show llamas, Jessica and Mike being members of ALSA and the ILR-SD. 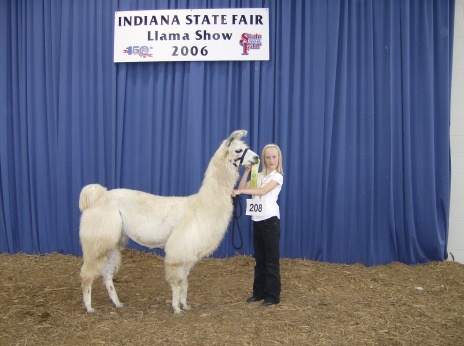 We also participate in the Indiana 4-H Lama program, Mike has been a leader and Jessica was a 10 year member. Our philosophies towards Llamas are to respect them, provide them a great home, and care for them to the best of our ability. Many of our llamas are rescue or rehab animals who now are going to live out their lives in a positive enviornment. We love to teach people about these awesome animals and share our experiences. Our llamas and one alpaca earn their keep on the farm. They roam the pastures and are great protection for our goats. When we hear their "alarm" call we know preditors are nearby, generally they see the llamas and one tough alpaca and back off. in 4-H ALSA and ILR Shows.